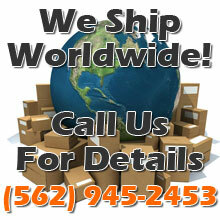 The best procedure for shipping motors we have found is through UPS. We recommend most single cylinder two stroke motors be shipped in 20 gallon Rubbermaid Rough Tote containers. Banshees and four stroke motors fit best in 22 gallon Rubbermaid Rough Totes. Rubbermaid Totes are available at Wal-Mart, Home Depot and Lowe’s type stores. They usually run less than $10.00. Do not use a plastic totes. Plastic totes are brittle, they tend to crack and break apart. PLEASE NOTE: Only use Rubbermaid totes for complete motors not top ends. Use a large cardboard box for top ends (cylinder and head combo) and lots of packing. You do not need to call us to let us know a motor is coming. We like to have you call us late the day we receive the motor or the following day. That way you know we received it and we can go over the details of what type of work you would like to have done. We will not call you when your motor arrives. We end up wasting too much time trying to find people that may be at work or whatever. We’re here, so call us when you know we have it. Drain all MOTOR OIL and ANY OTHER FLUIDS (otherwise your motor may come back to you with a cleaning bill from UPS). Please remove shift levers, un-needed cables, wiring, and any other small parts that may get damaged in the shipping process (if they are coming with the motor, them bubble wrap and bag them and incluced them with your package). We are not responsible for parts that get damaged in shipping. We recommend putting four layers of cardboard down. Put a layer of plywood or pine down next. Make sure the wood is much smaller than the bottom of the tote. You don’t want the wood to be against the plastic and cut the tote open. Then add four more layers of cardboard. Drop in the motor and pack alot of cardboard around the sides and top of the motor. We recommend that you zip tie a label with your name and address to the motor itself so that it would be returned in the event of UPS damage to the container. Make sure that all fluids are drained from the motor and carb (if carb is being shipped). Put the lid on the container. Drill 1/4″ holes every 4 to 6 inches around the lid and use plastic zip ties to fasten it. Insure your motor. UPS charges about $7.00 per $1,000.00 worth of insurance. So it’s cheap to insure. Some of the Happy Packy type shipping stores double the rate on the freight charge and the insurance charge, so you may find it best to take it to UPS or FedEx directly. We have had much better success on damage claims with UPS over FedEx. Listed below are values on what we think a used motor is worth. If you think your motor is worth more, you know what to do. Please make sure you insure your motor for the appropriate value.